Rockstar Doggy Momma is a healthy lifestyle community for women and their dogs. Come join us as we share simple FUN tips for both you and your pup! Marilyn Monroe may have believed that “diamonds are a girl’s best friend,” but I beg to differ. A girl’s real best friend is her furry companion, as all you Doggy Mommas know. My own best friend, Gatsby, inspired me to create the lifestyle brand Rockstar Doggy Momma (RDM), which is a healthy lifestyle community for women and their dogs. Our focus is on you having the freedom to live—and rock!—your life. And with your best buddy by your side, maintaining a healthy lifestyle is a lot less work and a lot more fun! because it’s a necessity (there is nothing of its kind out there). RDM is a necessity that meets the needs of both Mommas and their dogs—something that has long been missing from the lifestyle arena. A need for a supportive community, a need for an efficient plan to take care of us Mommas and our pups, not to mention a need for stress-free living that is focused on enhancing your life. As nurturing Mommas we always try to be everything to everyone, but in order to do that the person you need to take care of first is YOU. RDM is also about connecting amazing women who respect, love, and support one another—judgment free. It’s embracing your independence no matter your marital status, sexual orientation, career, or familial choices. RDM is about staying true to who you are separate from all the hats you might wear in a day! And all of us Mommas can agree that the place we feel the most free is hanging with our pups. We invite you to join our growing community so you can have the freedom to live—and rock!—you and your pup’s life! Erin Clifford is a certified holistic wellness coach and founder of Erin Clifford Wellness Coaching and Rockstar Doggy Momma. She is deeply passionate about working with families (including puppies!) and professionals in developing healthy lifestyles to create a more fulfilling, happier existence. She has trained with some of the world’s foremost experts in diet theories, nutrition, exercise, and healthy lifestyle management. Erin’s journey in wellness began when she was a teenager, growing up in the Northwest suburbs of Chicago. Her parents were extreme proponents of physical fitness and encouraged her to participate, from a young age, in many extracurricular activities that kept her active and fit. She also worked out regularly with her dad and immediately fell in love with both the physical and mental well-being that regular exercise provided. It became a lifelong commitment. During her college years at Northwestern University, she encountered her first Whole Foods, and it was a turning point in realizing that another key component to wellness is eating healthy. Erin began to integrate healthier foods and eating habits into her daily life and realized that not only did eating more nutritious food help her maintain her ideal physique but it also provided her with energy and a glow that made her hunger to learn more. Nutrition and healthy living became a passion and a way of life. Throughout the years, she continued to educate herself in cutting-edge information on health and has evolved her lifestyle toward optimal health and wellness. Erin first became inspired to pursue a practice as a wellness coach during her tenure as a Chicago Public School teacher. She created lesson plans every night to share with her students, but what she did not anticipate were the lessons she would learn from them about their challenges in health and wellness and how it impacted their daily lives, including their ability to learn. Many of these bright, young minds were fighting obesity and were well on their way to developing severe health conditions, such as type 2 diabetes. Some of her students would come to school having eaten Pop Tarts or Cheetos for breakfast. Others came to school without having eaten anything at all. This reality served as a “call to action,” and she promised herself that one day she would utilize her skills and her commitment to help impact people’s lives through educating and counseling families about healthy living and the prevention of disease. She also earned a law degree, and as part of the legal community, she witnessed how important a healthy lifestyle is for over-stressed professionals. Every day Erin encounters friends and colleagues who neglect their health and develop preventable diseases, many at an early age. Wellness education is critical in today’s society where fast-food can no longer be king, yet people do not take the time to learn what they need—even some simple steps—to help them for a lifetime. All of this inspired Erin to attend the Institute for Integrative Nutrition and complete its rigorous Health Coach Training Program. She studied more than 100 dietary theories, practical lifestyle management techniques, and innovative life-coaching methods with some of the world’s top health and wellness experts. But this learning never ends, as she continues her studies under the tutelage of renowned health professionals. 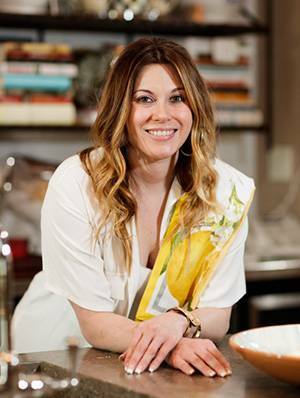 Erin’s vast educational background has equipped her with extensive knowledge in holistic nutrition, wellness coaching, and preventative health. Drawing on her skills and knowledge, she is passionate about personally working with clients to help them make lifestyle changes that are not only appropriate for their age, gender, work life, and pocketbook but also produce real and lasting results. In these busy times, she is the eyes and ears on the latest of what is going on in the health world today and how it impacts each individual client. She firmly believes that superior health is the cornerstone to ensuring a long, vibrant life. The birth of “Rockstar Doggy Momma” happened when her dog, Gatsby, was just a puppy. Gatsby suffered from chronic ear infections and after multiple visits to the vet, they were unable to find a lasting solution to these recurring infections. She hated seeing her forever friend in pain, so she began to research non-conventional solutions and consulted with top wellness professionals. And, guess what? Just like humans, it all begins with diet. Many traditional dog foods contain corn, corn meal, wheat, and by-products, which can not only cause your dog to gain weight but also lead to health issues like Gatsby’s. Erin began experimenting in the kitchen to see if she could create healthy meals for Gatsby that would be better for him than traditional dog food. Surprisingly, she found that cooking for Gatsby also de-stressed her. By incorporating more whole foods into Gatsby’s diet, such as lean meats and essential fatty acids and vegetables, he became ear-infection free. As an added bonus, her wallet became lighter—and so did her waistline! She was finally rocking her skinny jeans, and both of them were maintaining peak physical and mental health. Erin’s experience with Gatsby taught her that so often women take better care of their pets and loved ones than themselves. She noticed this in many of her clients. She realized that if she was committed to giving Gatsby the best life possible then she should also do the same for herself. 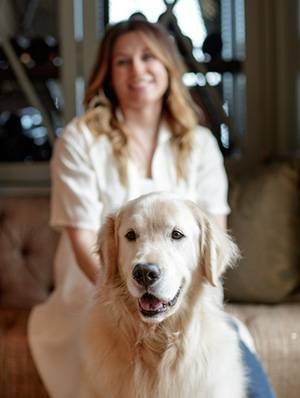 Many of the women she encounters in her wellness practice are also avid dog lovers, and they enjoy getting out and exercising with their pets. Bonding with a pet is the ultimate stress relief and guarantees lots of extra exercise! But her clients often struggle with the nutrition aspect of their diet and find it hard to stick with healthy eating on a regular basis. Erin knew that if she focused her clients’ nutrition not only on their own diet but also their beloved pets’ diets, they’d have better success. 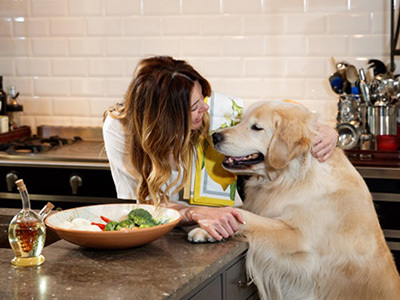 Knowing that the nutritious meals they cooked would also feed their dogs, it would give them added motivation to follow their healthy eating plan and keep them accountable, as well as a fun, furry companion in their wellness journey. Erin is on the women’s hospital board for Friends of Prentice, an organization dedicated to women’s health. She’s also a board member for Lawyers Lend-A-Hand, a tutoring and mentoring program for Chicago’s underprivileged youth. Erin is available to lead health and wellness workshops, speak at events on health, wellness and body confidence and is hired by brands to test/review products. Contact Erin online for more information.